Jacob Ranson, 22, will be part of the Algerian team – Algiers Corsaires – that faces teams from Morocco, Tunisia, Egypt, Lebanon and the UAE at the event, due to be televised on the Abu Dhabi sports channel next month. The Corsaires will play four game in round robin tournament format. When does the name on the back of a hockey sweater go far beyond simply identifying a player? Well, in the case of Edmonton Oilers forward Jujhar Khaira, the phenomenon takes place when the letters stitched on his orange and blue Oilers jersey represent billions of people hidden in the game of hockey. The 23-year-old son of Punjabi immigrants – who were volleyball stars in their own right – has finally found a meaningful role with the Oilers after bouncing between the pro club and its AHL affiliate for the past few years. Perhaps more importantly, he’s only the third player of Punjabi descent to play in the NHL, joining pioneer Robin Bawa and Manny Malholtra as the only other players from the region to play at hockey’s highest level. Though Khaira’s story is extraordinary, the family’s immigration story is not. They settled in Surrey, British Columbia along with a number of other Punjabi families. In fact, Surrey boasts one of the largest South Asian populations in all of Canada with folks from the region making up 30.7% of the city’s demographic. Sukhjinder and Komal Khaira were hardworking, blue-collar people toiling as a gravel truck driver and speech language pathologist. As they worked hard to provide for the family, Jujhar turned to Canada’s sport for assimilation. There’s a natural attraction to ice hockey for Indian immigrants for a couple of reasons. The first and least surprising is field hockey. It’s everywhere in India and the national team is one of the most dominant in the world. Although the game is played on ice in Canada, the speed and specificity of the game entices immigrants looking for a taste of home. “There is something that attracted recent immigrants to the game and that has to do with the link of field hockey, which is big in India, and ice hockey,” said Hockey Night in Punjabi host Randip Janda. The second reason is sociological. Hockey is so ubiquitous in Canadian society that new arrivals gravitate to the sport as a means of creating common ground. And according to Bhupinder Hundal, play-by-play announcer for Hockey Night in Punjabi, hockey passion in the Punjabi community has been growing for a long time. “It’s [the passion] been there for a long time, a couple decades or more, but now you see it really bubbling up,” he said. Whether he likes it or not, Jujhar Khaira is the face of hockey for more than a billion people. And if you ask Janda, there isn’t a more perfect idol for the number of young Punjabi’s looking to play hockey. “He’s not necessarily the most skilled player, he does have some, but he works harder than everyone else,” said Janda. In Surrey, a hockey rink today looks much different than it did even 20 years ago. The youth ranks are filled with players of different backgrounds and the ice is much more reflective of the community. But now, in light of Khaira’s success, all of those kids have a tangible idol they can try to emulate. Khaira, who has 21 points in 65 games with the Oilers this year, isn’t the only Punjabi succeeding at the higher levels of hockey. Look no further than his brother, Sahvan, who plays defence for the Swift Current Broncos in the WHL. There’s also Akash Bains of the Everett Silvertips. “Look around the BCHL and you’ll see five or six Punjab names on each roster,” said Janda. Though there’s just one Punjabi player in the NHL, Janda projects it’ll take a five to ten years before we see the true impact of Jujhar Khaira’s fame. In recent years there’s been an interesting addition to the Hockey Night In Canada Broadcast. Since 2014, Hockey Night in Punjabi has been a staple in thousands of immigrant households cross Canada. Each week they broadcast a hockey double-header in their native Punjabi tongue. The broadcast reached peak notoriety during the 2016 Stanley Cup Finals, when Harnarayan Singh’s infamous “Bonino-Bonino-Bonino” call of Nick Bonino’s overtime, series winning goal went viral. While that moment might’ve exposed the larger hockey community to HNIP’s existence, it’s the mark they’ve left on the Punjabi community each Saturday night that makes them most proud. According to Hundal, the cities with the largest South Asian communities across Canada are Edmonton, Vancouver, Toronto and Calgary, so heavy airtime is devoted to those teams. That quintet of cities makes up roughly 90% of the entire Punjabi population in Canada. They’ve also penetrated into American cities such as Chicago and Pittsburgh and see a ton of web traffic from Punjabi hockey fans living overseas. Back in Canada, Hundal says the data suggests that the broadcast has reached more than 55% of all Punjabi homes. “We’ve been able to connect with so many people in the community,” Hundal added. Both Janda and Hundal point to the fact that the broadcast has connected multiple generations of Punjabis to the game of hockey in a way they weren’t before. 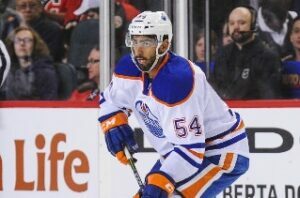 The broadcast is also seeing a boost now that Khaira has found a permanent role with the Oilers – giving HNIP a familiar face to feature and one that Indian people everywhere can celebrate. “He’s representing the hopes and dreams of so many young South Asians,” Hundal said emphatically. According to the IIHF Survey of Players there are just 1,293 Indians currently registered to play hockey back home in India and roughly one-quarter are women. The country’s hockey is based in the northern parts of India such as Ladakh where it gets cold enough that hockey can be played on natural ice for a few months during the winter. So, in light of this data, is India the next frontier for hockey? Well, Janda says yes, but with a caveat. “India is definitely the next global destination for hockey, but it’s such a new game there,” he said. Infrastructure is a financial thing, but if you’ve read the news lately you know that India is rising in that category. According to an October report from the World Economic Forum, India is the seventh largest economy in the world and is projected to trail only China by the year 2050. Finding a player base shouldn’t be an issue. The country boasts 1.3 billion people and as stated earlier, hockey is already semi-engrained. Understanding that India is hockey’s next frontier, Canadian legend Haley Wickenheiser launched the India2YYC Initiative project. The project is two-pronged. First, Wickenheiser and former NHLer Andrew Ference led an envoy of hockey officials to Ladakh, India, to coach female players and expose more to the game in January. “It’s just about more than [hockey]. It’s about empowering women and children, and it’s about giving them confidence. It’s about being a part of something bigger than yourself and making a difference in another part of the world,” Wickenheiser told the CBC. Secondly, Wickenheiser will welcome those same participants to The Canadian Tire Wickenheiser World Female Hockey Festival in November 2018 to further their development and exposure to the game. Wickenheiser’s initiative is an important one, but it’s still early days. India isn’t an ice hockey country yet, but the opportunity is there. And given Khaira’s success and the impact of Hockey Night in Punjabi, it seems there is momentum for the game in India.